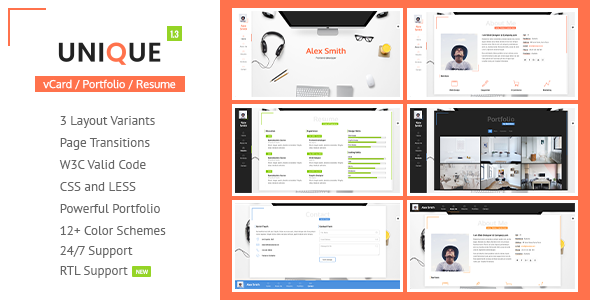 Unique Resume, vCard, CV, Portfolio Template — A premium tool to promote yourself. Ready to look stunning on any device – from a widescreen monitor to a mobile phone. 12 Beautiful Color schemes are built in and its easy to set any color to elements such as links, buttons, menu links, etc. Need Someone to Customize this Template? 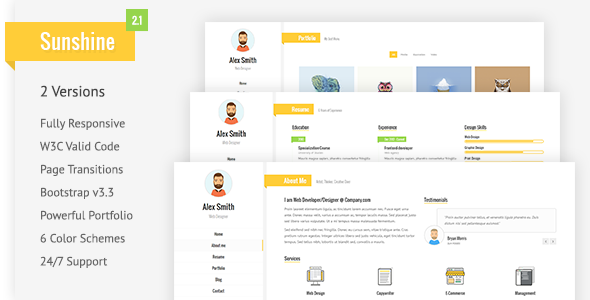 You can get this template customized by me, at low fees, I’m available for freelancing, so if you want to hire me, contact me via contact form on my profile page. Improved: Mobile mode: Scroll performance on older devices. Updated: Documentation: Added the Updates section with detailed instructions. Important note: This is an HTML template not a WP theme. Please make sure you need the HTML version before purchasing. We can’t be held responsible for wrong purchases, we won’t be providing any refunds for purchases by mistake. You can reach the WP version here.